Wordless picture books have such strong narrative power, and Thunderstorm typifies the strength and impact imagery can impart. Although not completely wordless (the book features times dotted through the pages--the entire thing takes place on a Saturday afternoon on 15 July), it is the magnificent, detailed, double-page spreads that carry a storyline that will move readers of all ages. It's Saturday afternoon on the farm, and a storm is coming. Black clouds roll over the horizon and lightning cracks in the distance. The family are delivering hay to their livestock. The animals know what's coming. They begin seeking shelter and higher ground. The family load the hay into a barn and head for home. In the distance, we see a tornado is on its way. It pulverises everything in its path. At the bottom of each page, we catch glimpse of what's going on under the earth, too, with little mice burrowing down to hide, and the roots of trees clinging grimly to the soil. The storm is overhead and the sky is black. The family are racing against time to get home but the storm is too forceful and they find themselves taking shelter under a bridge--until the riverbanks burst, and -- CHAOS! This is such a visually powerful story about the tragedy of flood and storm, especially in rural settings. But it's also about love, togetherness and rebuilding as a community, which is exactly what the family do. 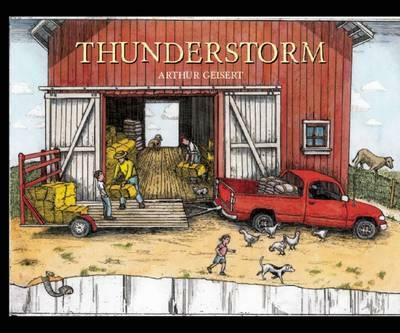 With a calm, regenerative conclusion, Thunderstorm is a wonderful talking point for children of all ages, with high-detail illustrations that will have kids poring, wide-eyed, over its pages.